Popular among evolved travellers, Oman mesmerises visitors with its authenticity, natural beauty and rustic adventure terrain. One must plan a trip to Oman to relax, rejuvenate and indulge in adventurous activities like sand dune bashing, mountain treks, water activities and much more. Here is some of the must-do things while for an adrenaline-filled holiday. Indigenous to Oman are wadis (valleys) that are naturally created swimming pools formed due to rainwater, making an ideal place to swim or a day picnic. Al Hajar Mountains in Oman have many wadis and ideal locations for canyoning, and among the most pristine is Wadi Bani Khalid, around 200 kms from Muscat, which is always full of water. Offering an ultimate mix of adventure, Wadi Bani Awf, the narrow gorge or snake canyon contains an interesting 3 km route for canyoning that can be covered in 3-4 hours. Go off the beaten path and discover new places by cliff jumping and swimming through clear, deep pools, leaping through amazing waterfalls or walking through stunning locales. Once the activity is complete, it gives a sense of achievement and satisfaction of having passed through various terrains and obstacles. Enjoy the mercury drop at the top of Oman’s popular mountains Jebel Akhdar and Jebel Shams, best known for their spectacular views, adventure travel and rich cultural experiences. Along with the thrilling 4x4 drive, challenge your peers to hike and rock climb, go mountain biking, cycle through the stunning landscapes, play football overlooking the mountains, try via ferrata for the adrenaline rush or simply walk through the abandoned villages to understand the nuances of local Omani lifestyle. 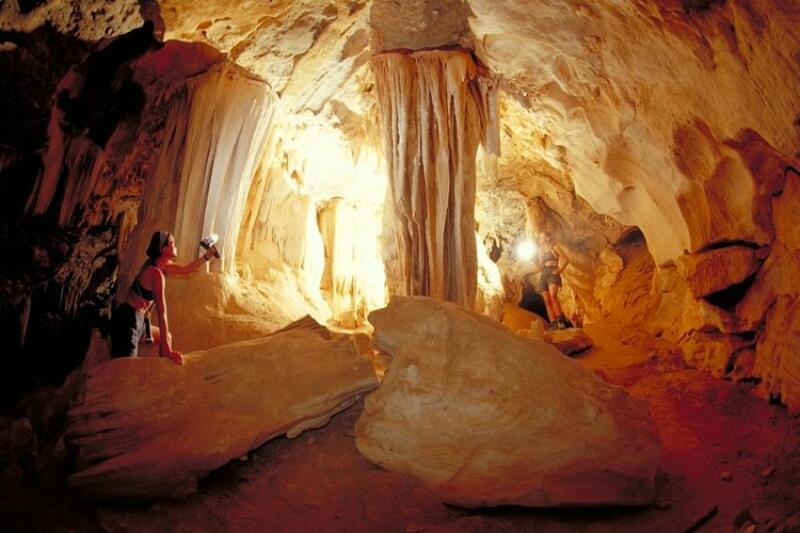 Estimated to be over 2 million years old, the Al Hoota Cave is one of Oman’s most popular natural tourist attractions. Located off route 21 between Nizwa and Bahla at the foot of Oman’s epic mountain Jabal Shams, just 2 hours drive from Muscat, it is the first and only cave in the Arabian Peninsula which is open to visitors. Ideal place to visit for trek lovers, the cave is around 4.5 kilometres long with around 500 metres of area accessible to the general public. The one hour guided tour starts from the Visitor’s Centre with a short ride in an electric train that carries passengers up to the cave entrance. Once inside the cave, it’s a feast for the eyes as you walk on the pathway and witness an enormous subterranean cavern filled with stalactites, stalagmites and colourful solid rock columns. Oman is also home to some of the best dive sites with spectacular underwater world, kite surfing sites and various other water activities to enjoy. A scuba-diving or snorkeling trip is highly recommended along with kayaking. Watching hundreds of dolphins jump in the air acrobatically and swim in the blue waters of Oman is an unforgettable experience. Oman is a sailor’s delight as it houses several world class yachts, cruises and a stunning marina. You could also experience barbeque evening with a cabana setup on one of the private island in Muscat. Honey, Russet, Orange, Sorrel, Chestnut, Sienna, Copper, Ochre, Amber- pick any shade of brown from the palette and you might just find it in Sharqiya Sands, Oman’s longitudinal dunes that sprawl 200 km long and 100 km wide. Engage yourself in exciting activities like Sand Boarding, Dune Bashing, Quad Biking, Camel Safari among others. Stay at any of the luxury camps for the best glamping experience in the desert. With close proximity to India, good flight connectivity from various Indian cities and offering simplified visa process, Oman should definitely be on the go-to list for adventure enthusiasts.